One advantage of having my talented journalist boyfriend home for a visit is that I get great photos of my latest activities! 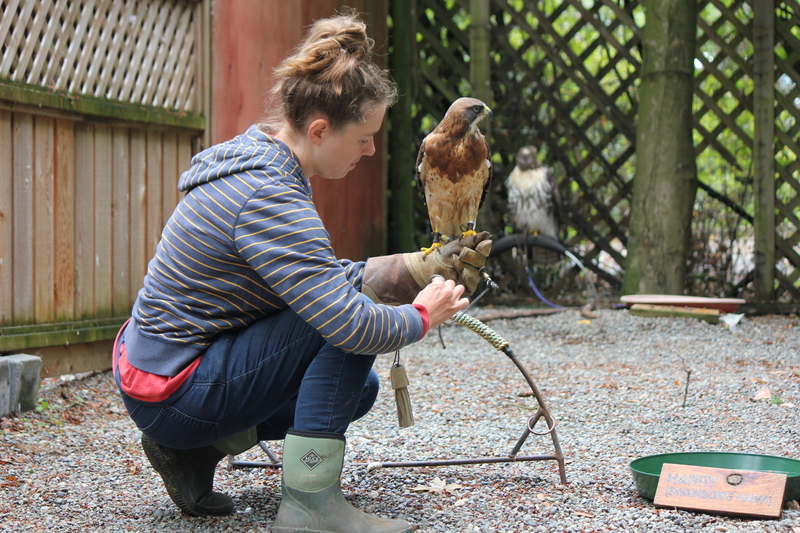 I’ve been working at the Raptor Centre for about a month now and it’s been magical. 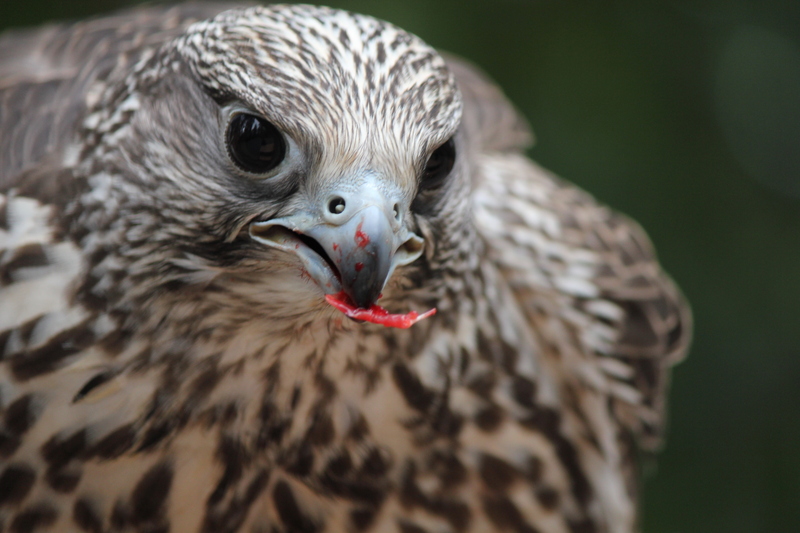 I’m lucky to be there at a time when there are many young birds to train: Cooper’s Hawks, Red Tailed Hawks, Harris Hawks, Peregrine Falcons, Gyrfalcons and Gyr/Saker Falcon hybrids. They all need glove training and flight training. 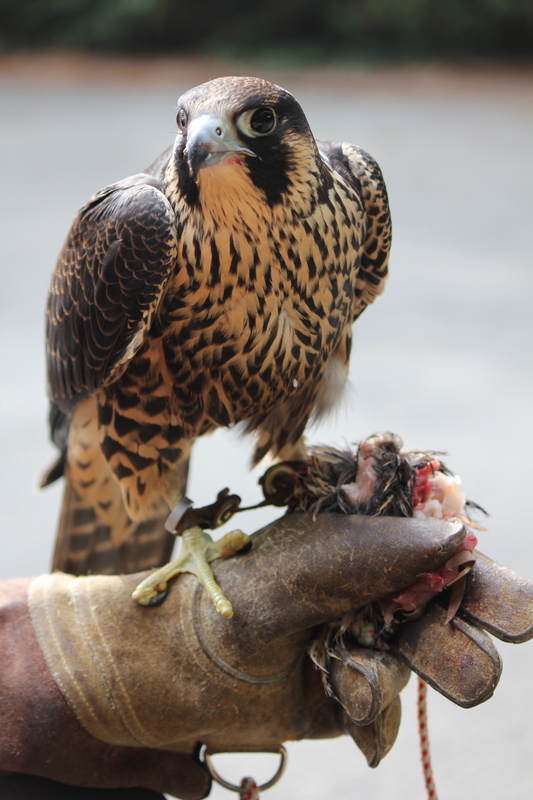 Above is a young Peregrine Falcon I’m feeding on the glove. This is so he can learn that the glove is a nice place to be where he gets to eat. 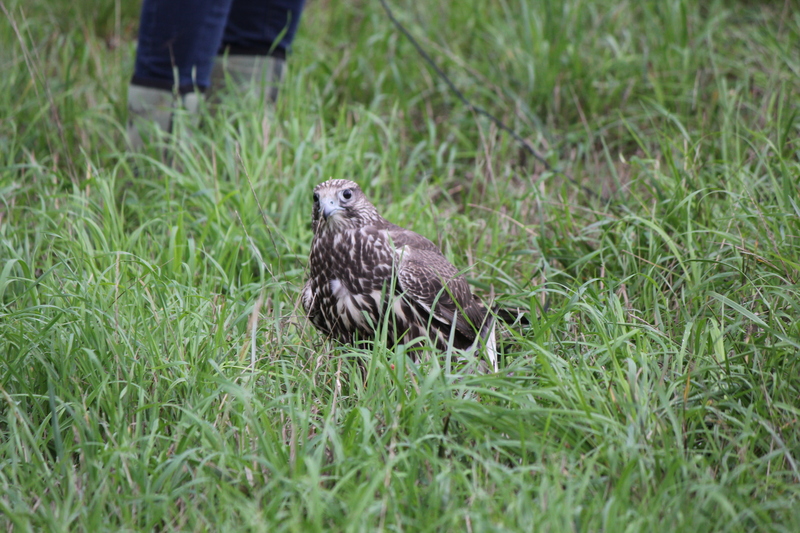 At first he wasn’t interested in his chunk of raw quail and was preoccupied with trying to take it away to enjoy somewhere else. You can see how hard he was leaning to one side. 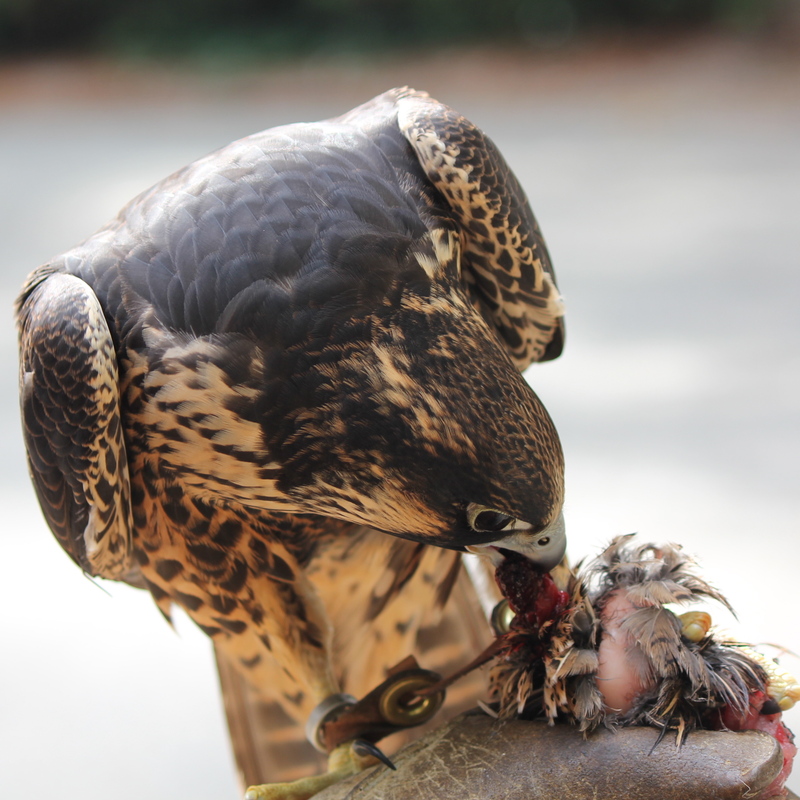 Once I tried wiggling the meat in my glove a little he changed his mind and decided to chow down. 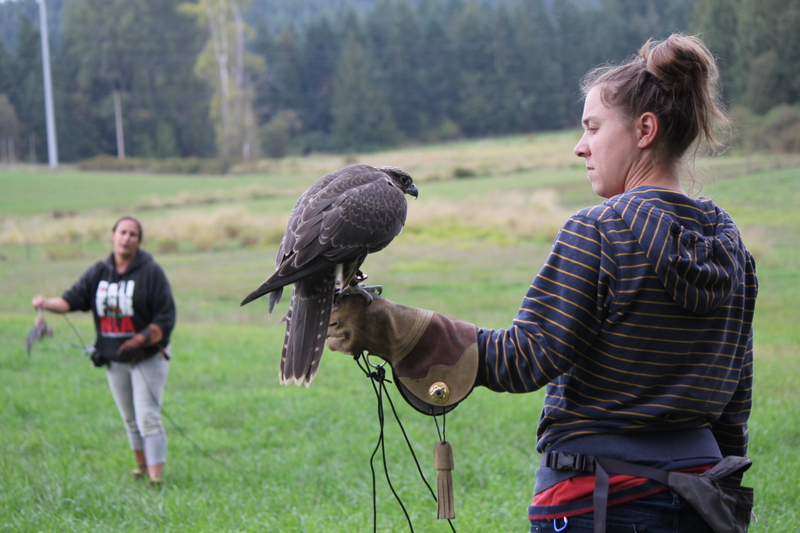 Some of the training we do is simply manning birds, which means to carry them around on the glove. 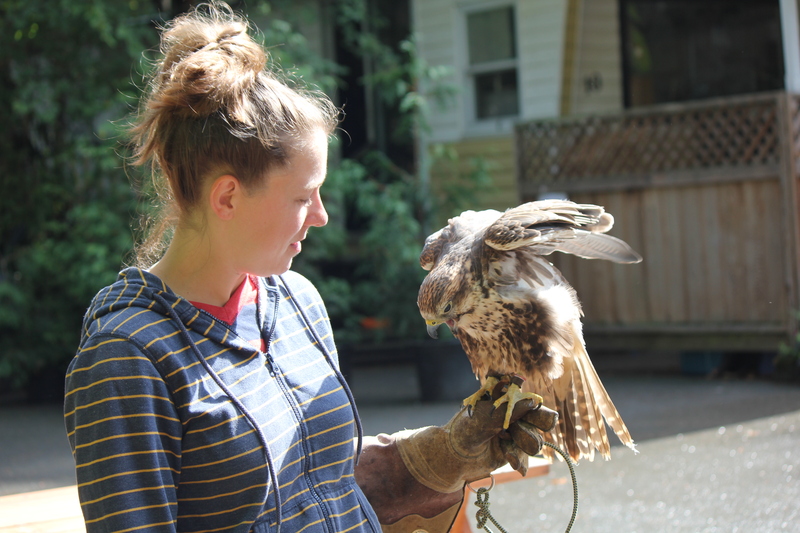 This is just good practice for the birds as they get to observe their surroundings and form positive experiences. 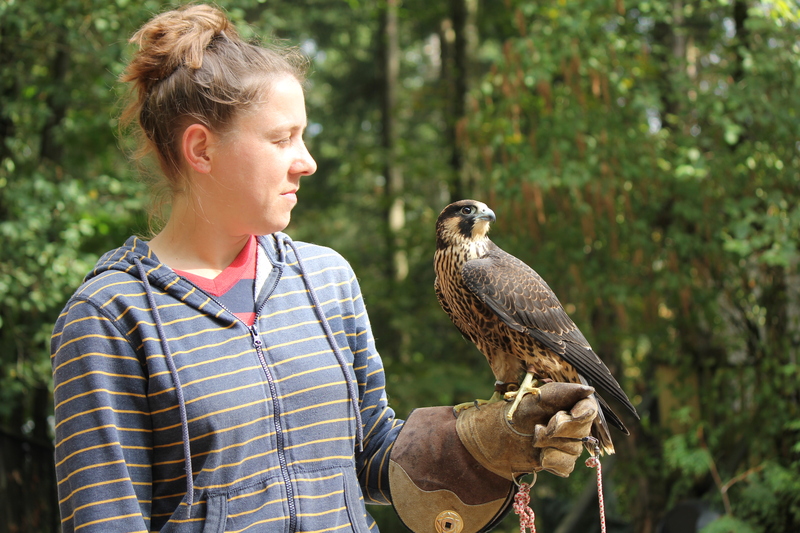 Of course some of our birds are very well trained already like Bell the Saker Falcon (above photo) and Harry the Swainson’s Hawk (below photo). 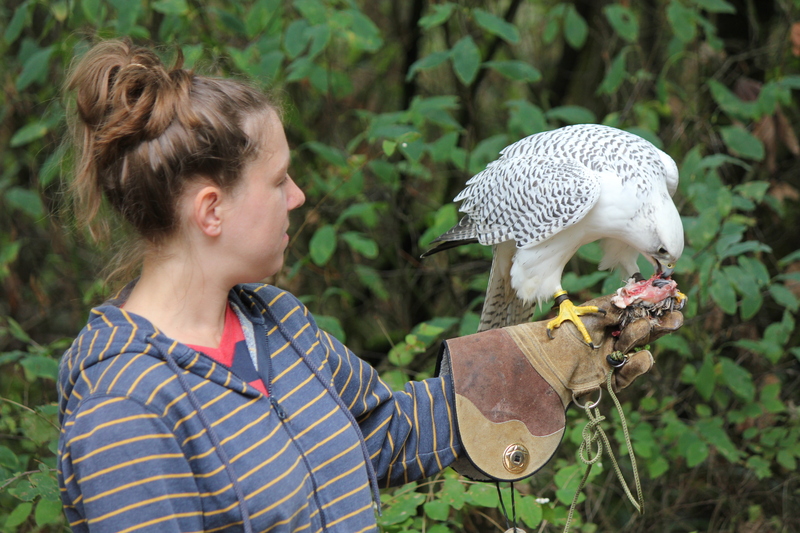 Next up is feeding a Gyrfalcon/Saker hybrid on the glove. 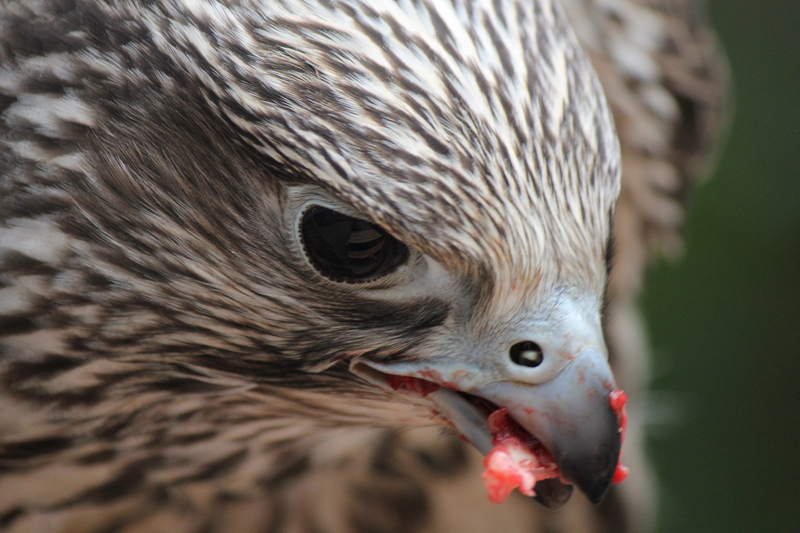 This little beauty tore through her portion of pigeon in no time. 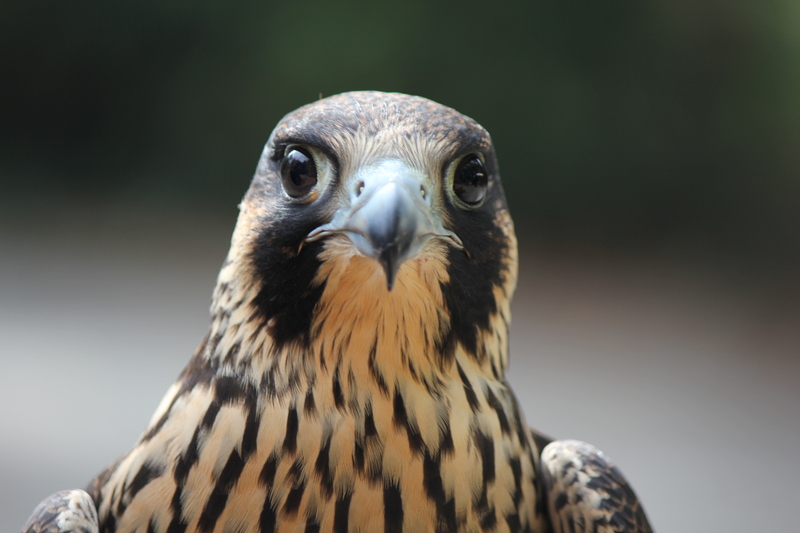 You can tell she’s young because of the bluish tinge to her cere (nostril area) and feet. These will mature to a bright yellow color. 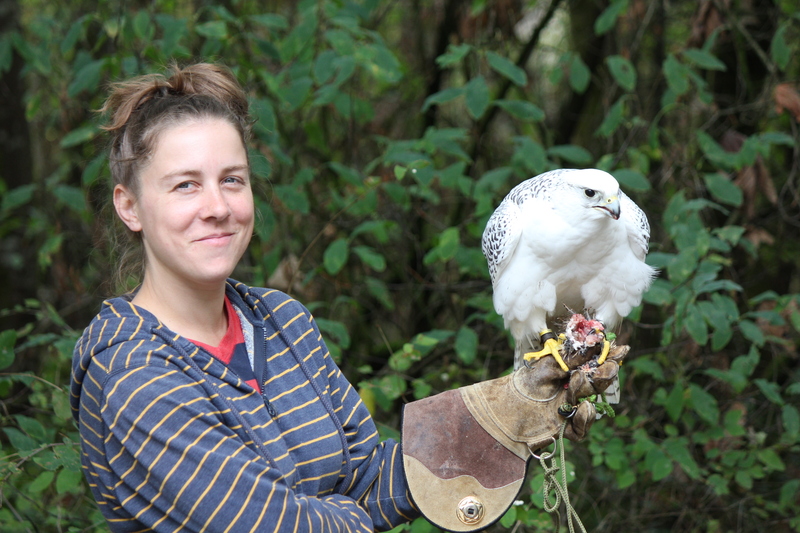 Finally, feeding a pure white Gyrfalcon on the glove. 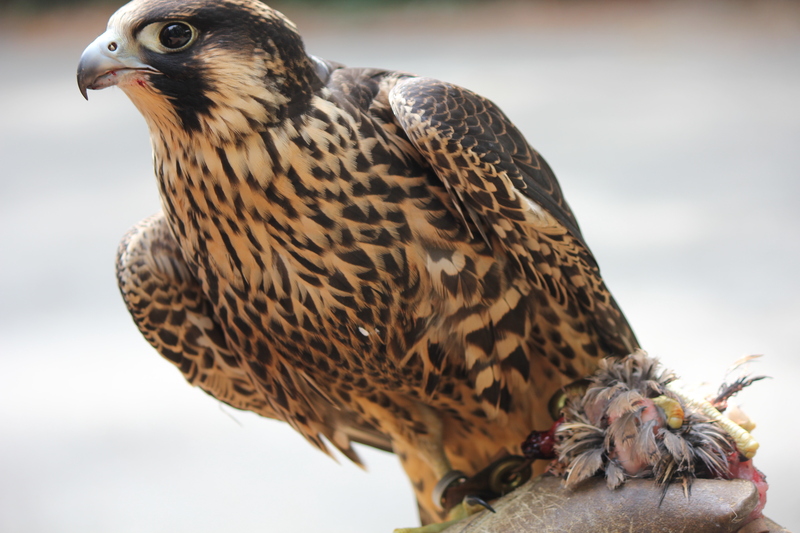 Gyrs are magnificent birds that used to be reserved for kings and nobles in European falconry. 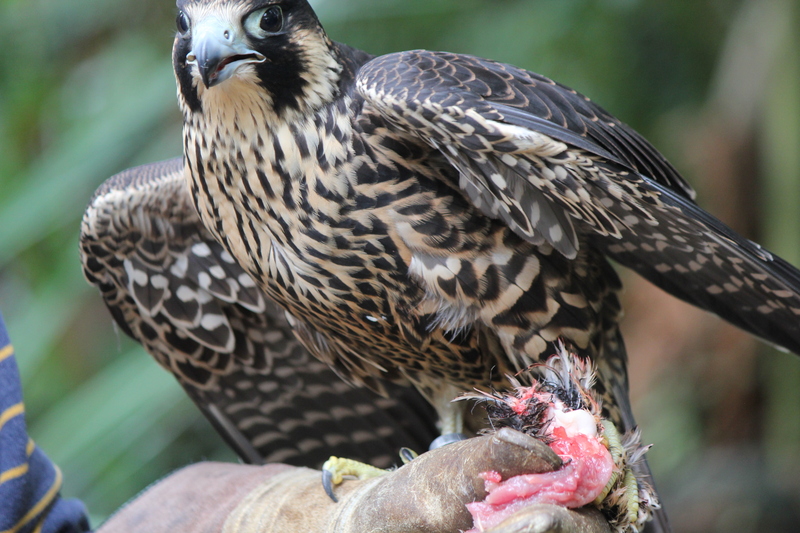 They are very impressive, especially when tearing apart their prey. Thanks for reading! All photos by the Stuttering Journalist. My lovely boyfriend who has been working in Nunavut for the past four months recently came home for a much needed visit. 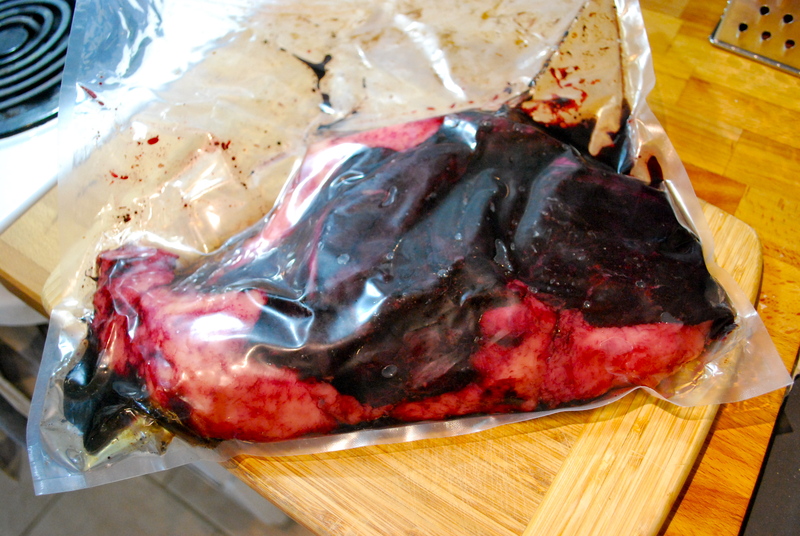 It was a great opportunity to try the seal meat that he sent me that has been patiently waiting in my freezer… Although seal meat never quite freezes solid as it is permeated with a thin oil throughout. We decided we wanted to try it raw first for a comprehensive experience. It was a rather large vacuum-sealed slab weighing around 3 lbs that had set him back $26 at a country food shop in Iqaluit. We think the species might be ringed seal. Looking at the frozen slab, I could see light areas as well as very dark, almost black sections. Upon defrosting, I could see that the light areas were a thick layer of fat covering one side, while the dark areas were the meat itself. I also noticed that there was a section of ribs included, a lot of blood and a watery-thin oil slick sitting on top of everything. When the package was opened, there was a faint fishy/ocean smell. I sliced some very thin pieces of meat for trying raw, then briefly sauteed some small steaks in butter with grey salt and pepper. 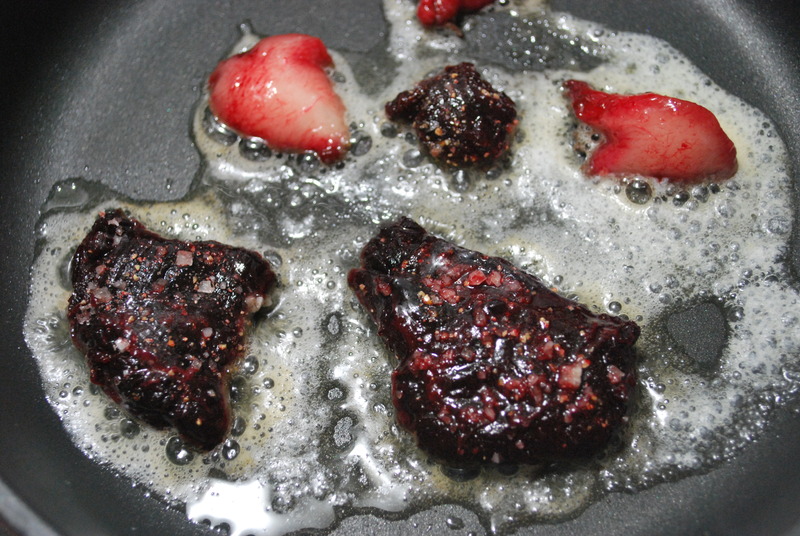 I also prepared some small chunks of the fat and browned them on all sides. Looking back, I don’t think the butter was necessary as the fat and oil should have done the job nicely. 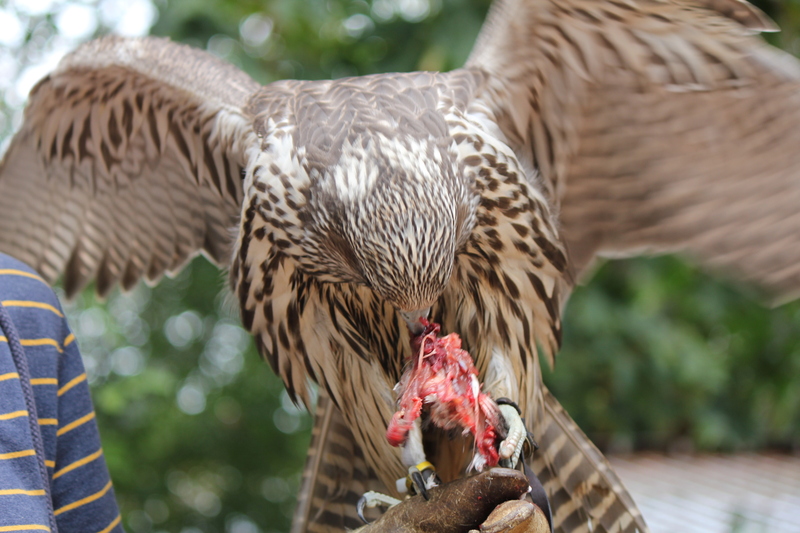 The raw meat had a very rich, gamey flavor, reminiscent of quail. 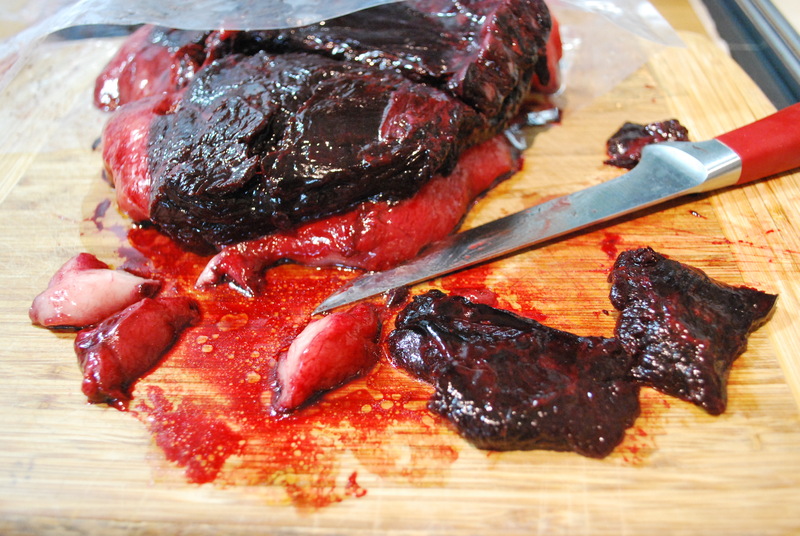 There is also somewhat of a metallic hint that you might compare to liver or filet mignon. I think this is due to the high iron content. It has a slight fishiness and would not be out of place on a sushi platter. Blindfolded, I’d compare it to a nice piece of tuna with a more slippery and firm texture. It should also be noted that the thin oil coats your hands when prepping seal and makes them feel very soft and smooth. Once the meat has been seared, the fishy flavor seems to disappear entirely. 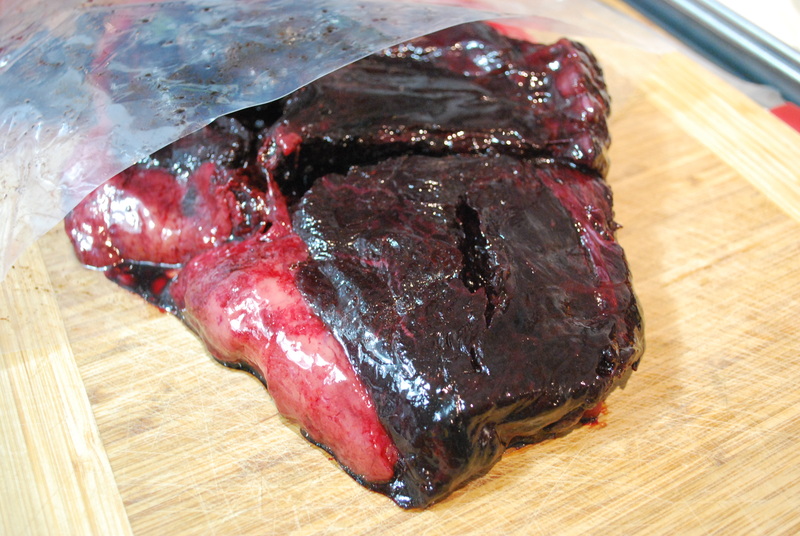 What you’re left with is a very tender, juicy and delicious rich steak flavor. It basically tastes like the finest aged beef tenderloin. The chunks of fat brown very quickly but stay white and soft on the inside. They disintegrate in the mouth with a floral creaminess and a slight fishy aftertaste. 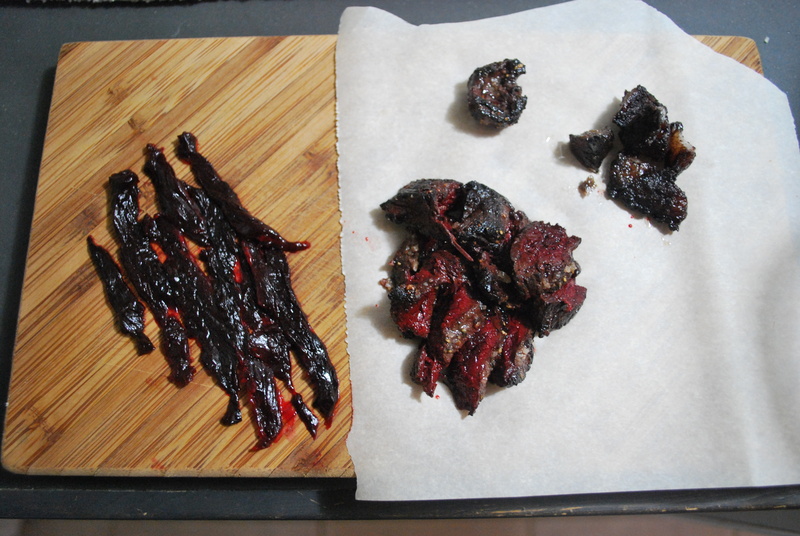 My conclusion is that seal is super delicious and probably some of the best meat I’ve ever tried. The “fishy” flavor I keep describing is really more of an “ocean” flavor, which is very hard to describe. It fills your nose in a different way than actual fish. It reminds me of being on a tiny boat in a storm fishing for salmon. I’ll probably use the rib section for a pie or a stew, and I will likely eat the rest simply seared like a steak. 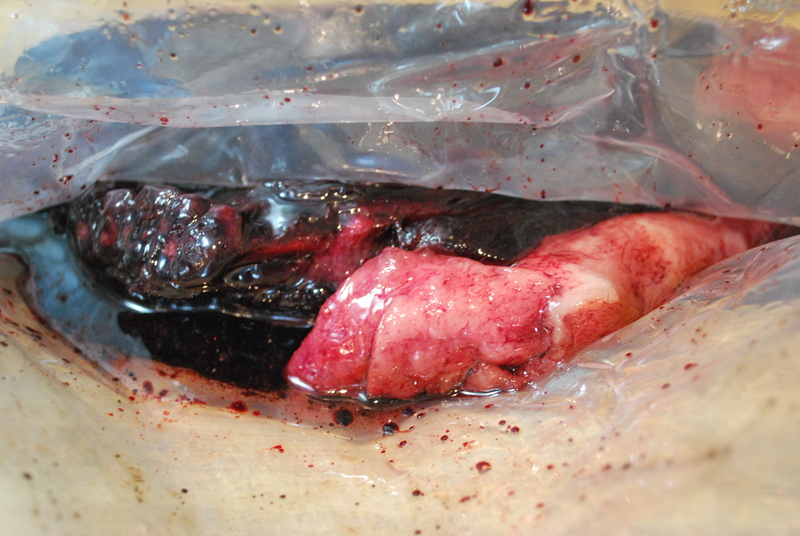 There is a substantial fat layer covering one side that I’m not entirely sure what to do with, but I would like to attempt turning it into fermented seal oil, which is a common seasoning in Inuit culture. 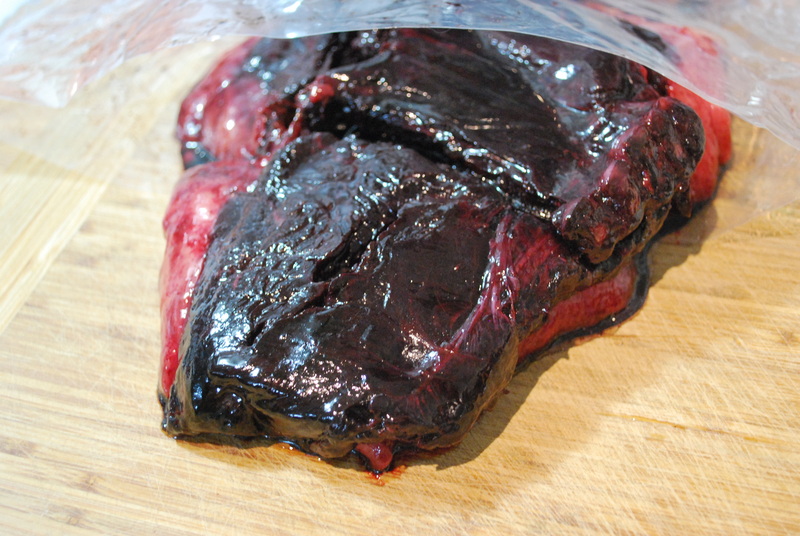 If you ever get the chance to try seal meat, don’t pass up this unusual vittle. You’ll be glad you didn’t!